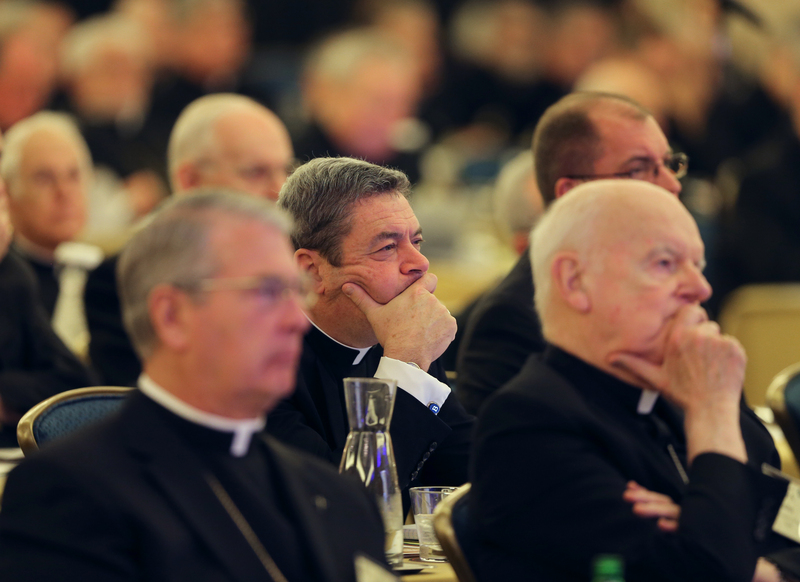 Bishops listen to a speaker Nov. 13 during the fall general assembly of the U.S. Conference of Catholic Bishops in Baltimore (CNS photo/Bob Roller). Bishops are considering forming a pastoral plan on marriage and family life in response to “Amoris Laetitia,” the pope’s 2016 pastoral letter about families, though the plan would not be ready until November 2019. Later in the day, bishops announced the proposal had passed with an overwhelming majority. Bishop Richard Malone, who sits on the Committee on Laity, Marriage, Family Life and Youth, told bishops that the plan would “encourage a broader reading of ‘Amoris Laetitia’ and seek to advance more conversation” around “strengthening marriage and family life.” It would offer a framework for parishes and dioceses to create and implement pastoral plans. In the letter, Pope Francis calls on pastors to accompany married couples and families through challenges they encounter in life. In one chapter, he speaks about the need to provide pastoral care to Catholics living in irregular family situations and he includes a section that some bishops have interpreted to mean that some divorced and remarried Catholics could be admitted to Communion after a period of prayer and penance. The pope has signaled that this is the correct interpretation, leading to criticism from some corners of the church. Bishop Robert Barron, an auxiliary bishop in the Archdiocese of Los Angeles with a large social media presence, called ‘Amoris Laetitia’ an “extraordinarily rich document” and he said it was “a tragedy that the reception to this document in our country has been so poor.” He said “an awful lot of people in the blogosphere” are “forcing people to read this document in a particular way” and that bishops should “seize control” of the narrative. Bishop Joseph Strickland blamed “media distortions” for focusing attention on the divorce question. This is the first attempt by U.S. bishops as a body to implement the teachings in ‘Amoris Laetitia’ on a large scale. Other efforts have been confined to individual dioceses, though last month at Boston College, Cardinal Blase Cupich of Chicago and James Keenan, S.J.,co-hosted a conference with bishops, priests and lay theologians about how to further promote the letter. How can the church and laity work together to promote ‘Amoris Laetitia’? Many bishops who spoke in support of developing a pastoral plan based on ‘Amoris Laetitia’ said the document should address the needs of young people, who are marrying at record low rates in the United States. Bishop Jaime Soto, who leads the Diocese of Sacramento, highlighted the role economic inequality plays in decisions about marriage. The “growing economic disparities in this country [are] also leading to marriage disparities in this country,” he said, with the “well to do” getting married with the benefit of “maintaining their social position” while the poor “feel they don’t have the means to make a life-long commitment.” He said the result is that economic poverty is joined by moral poverty. ★ S­­­u­­­p­­­e­­­r ­­­a­­­n­­­d ­­­E­­­a­­­s­­­i­­­e­­­s­­­t­­­ ­­­0­­­n­­­l­­­­­­!­­­n­­­e­­­e­­­ ­­­H­­­o­­­m­­­e­­­ ­­­o­­­p­­­e­­­n­­­ ­­­d­­­­­­o­­­o­­­r­­­ ­­­f­­­o­­­r­­­ ­­­a­­­l­­­l­­­. ­­­m­­­a­­­k­­­e­­­ ­­­8­­­7­­­ ­­­D­­­o­­­l­­­l­­­a­­­r­­­s ­­­f­­­o­­­r ­­­e­­­v­­­e­­­r­­­y ­­­h­­­o­­­u­­­r and Make 52512 Dollars for each month.All you simply Need an Internet Connection and aComputer To Make Some Extra money. I find some of the comments of the bishops to be characteristic one of the problems with the USCCB, such as blaming media distortions for focusing attention on the divorce question (as though the media is distorting the truth by focusing on a major issue that everyone has been talking about for the past 2 years) or that some people in the blogoshere are forcing people to read this document (Amoris Laetitia) in a particular way (as though these so-called blogosphere people are misleading the rest of us) then encouraging the bishops to 'seize control' of the narrative (I assume for the objective of forcing people to read AL in their way). It will be interesting to see precisely what the USCCB will say in this future pastoral letter that will suggest to bishops and priests how to treat gay and lesbian Catholics with respect, compassion and sensitivity, and the guidelines, if any, they will suggest for permitting Holy Communion for the divorced and remarried. I wonder what Pope Francis will do if the USCCB recommends or suggests that only divorced and remarried Catholics who have obtained an annulment or elect to live as brothers and sisters can received Holy Communion. Perhaps they will punt and leave it to each individual bishop, which is how AL was written. Dominic Deus here. Michael Barberi, you are such gentlemen critic. Some intractable bishops deserves even less credibility than you give them..
My experience has been that divorced Catholics receive the Eucharist with as much devotion and piety as un-divorced Catholics. Furthermore, their fellow Catholics most often know they are divorced and don't care. Approaching the communion rail (well, if we still had them) in faith is all that matters. In addition, I have spoken with a number of parish priests who make it absolutely clear they do not track parishioners by their divorced status, remarried status, skin color, or anything other than approaching the aforementioned nonexistent communion rail and they offer the Body and Blood of Christ to those who reach out there hands to it. I have had more than one parish priest advise even addressing the issue of divorced or remarried Catholics from the pulpit would amount to a dramatic loss of parishioners along with said parishioners money. In other words, only a complete fool would raise the issue. Just in case anyone has missed it, Catholics have been divorcing and remarrying only slightly less that their non-Catholic friend for about two decades. That means that on any given Sunday, your average priest is addressing a congregation in which 30%-40% of those present are divorced, remarried or both, and of course, one must factor in those who just stopped coming to Mass at all but have proven themselves to be perfectly good Lutherans, Methodists or whatever, tithing and pledging, contributing to the furnace fund and youth group. Many strong-in-the-Faith Catholics will simply take a walk on an offensive parish priest or pulpit condemnation and drive 20 minutes the other direction to a welcoming parish. In speaking with large college or university students I have learned that non-Catholics are frequently attracted to the Catholic Mass, especially if the priest is engaging, and, on occasion, they approach the Eucharistic minister or priest to receive and receive they do. All this is by way of saying that some bishops appear to be intent on seeing as many Catholics as possible hurl themselves out of communion with the Church like lemmings going over a cliff. If you follow the admittedly niche field of lemming studies, you know that the lemmings in front don't actually commit suicide of their own free will. They are pushed from behind by other lemmings who have no vision of where the herd is headed; in other words, Magisterial lemmings. My thanks to the non-lemming bishops who want to move the Church away from self-destruction, and by the way, I like being treated like a lemming even less than I like being referred to as a sheep. I prefer to think of myself as a Billy Goat Gruff, or possibly Leo the Lion, or at worst, the Pokey Little Puppy.